As you know, I am a big believer in emergency knitting - mindless, compact, lightweight projects that can carry you through many hours of near-panic without requiring any special attention or enthusiasm. The only solution to that sort of requirement to my mind is socks, because after a few emergency projects you get pretty sick of the mindlessness, and only the unearthly delight of wearing handknit socks at some point in the future will get you through said knitting and see you tucking more of the same into your purse. You on the other hand may have an endless appetite for cowls, or for hats - though hats may require a second set of needles as you decrease for the crown - or for laceweight shawls. 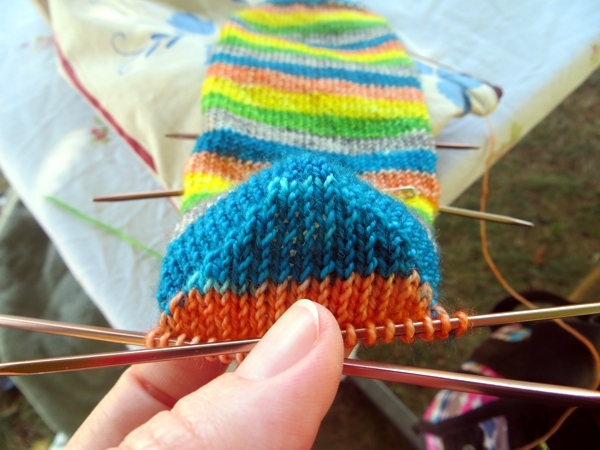 I still like socks, which may or may not have something to do with the enormous and daunting degree of sock-yarn dominance in my house. Emergency knits are not just for emergencies. They are also very helpful at a cottage, when the only inducement to knit at all is that it's too cold to swim, or you have guests to chat with, or you are playing Scrabble with enough other word- or score-obsessed people that your turn will take a while to come around. 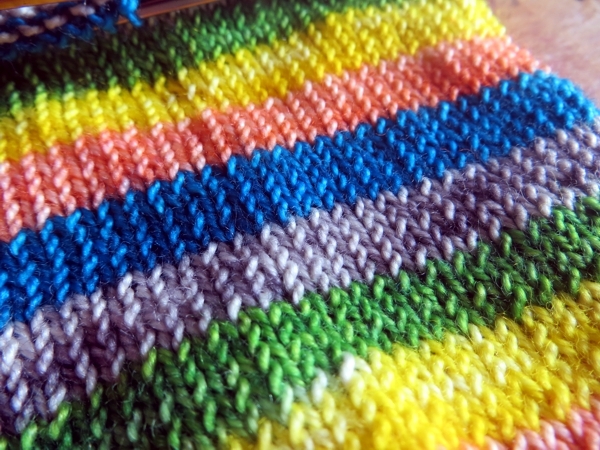 Maybe there's something wrong with me but I eye complex knits with resentment if they expect me to knit them away from the breezes of the deck or the view from the dock, both of which have tiny slats through which knitting needles can fall, never to be found again. 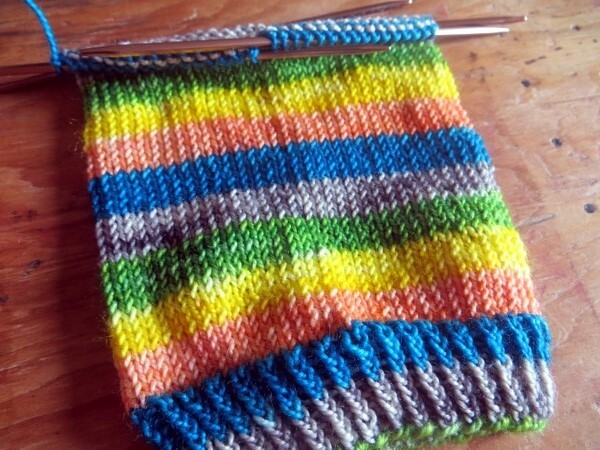 Another attractive feature of emergency knitting is that it's easy on your eyes, since there's little need to look down. 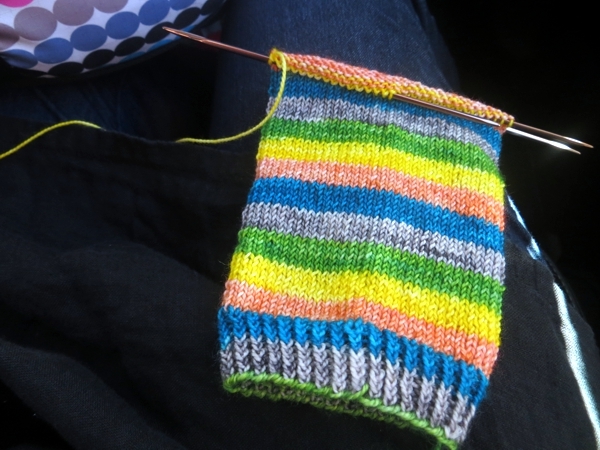 I noticed while I was knitting some socks with non-standard ribbing on a long car trip recently that my vision got quite blurry from watching to make sure I got the next stitch right, and I had to switch over to my emergency knitting just to help them recover. ... anything that involves waiting for an indeterminate time and then thrusting the knitting into a bag so you can rush off to the next part of the day. 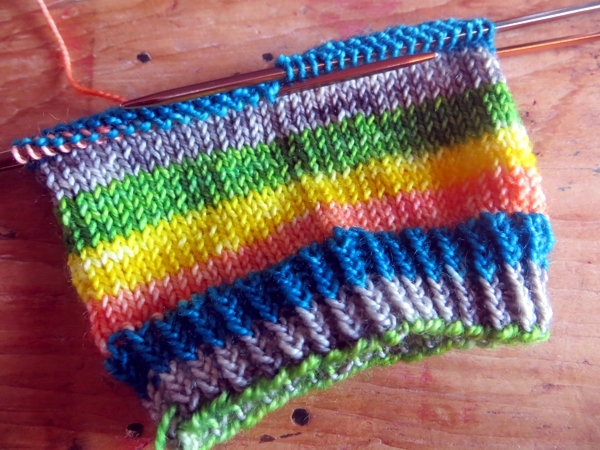 You're never caught in mid-cable or mid-lace-petal when you're emergency knitting. Best of all though? ACTUAL EMERGENCIES. Criminy. Who expects to head to two different emergency rooms in two different cities for two entirely different people over just five days? Emergency knitting: get some. It's pretty and everything. Enjoy your holiday Monday if you get one too, and I'll see you tomorrow! self-stripping yarn is exciting enough for the mindless emergency knitting. love the yarn!